3 Masters w/King, 1 w/Queen, 1 w/2 Twins, 1 w/Pyramid Bunk, 1 w/2 Bunk Sets. Sheets & Towels Provided. 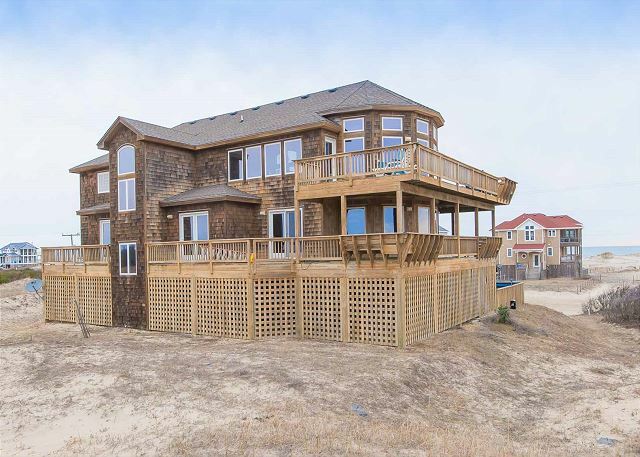 Beautiful semi-oceanfront 7 bedroom home sits atop a dune with spectacular ocean views. Spacious interior and lovely decor makes this the perfect getaway for rest and relaxation. 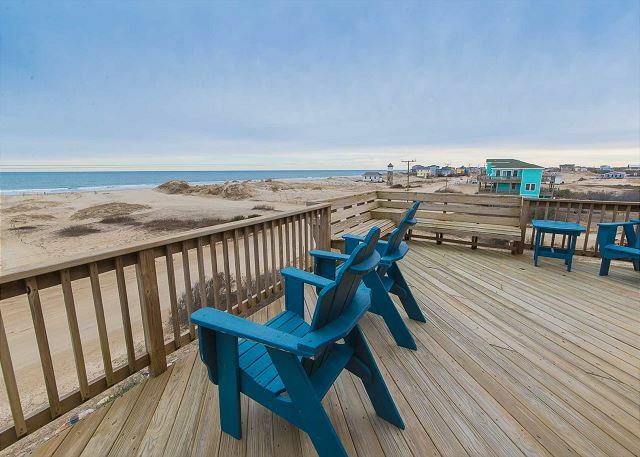 Soak up the salty air while relaxing in the hammock or Adirondack chairs on one of the large decks. You may even see some of the famous Corolla Wild Horses roaming around the property. Amenities include a private pool, hot tub, tiki bar w/fridge, corn hole game, gas grill, rec room with pool table, Megatouch video game and wet bar. 2 washers and dryers, 2 dishwashers, bed linens and towels and 2 Jacuzzi tubs. This home is pet-friendly and non-smoking. Keyless entry for your convenience. 500 feet to the beach access. Lower Level Outside: Pool w/Furniture, Hot Tub, Tiki Bar w/9 Stools, Refrigerator; Outdoor Shower. Lower Level: Rec Room w/Pool Table, Wet Bar, Golden Tee Game, Mega Touch Game, TV, Stereo; Half Hall Bath; Washer / Dryer in Closet. Mid-Level: King Master w/Large Flat Screen TV, Jacuzzi & Separate Shower, Deck access, Ocean View; King Master w/Large Flat Screen TV, Jacuzzi & Separate Shower, Deck access, Ocean View; Bedroom w/2 Twins, TV, Deck access shares Full Bath (Tub/Shower) w/Pyramid Bunk Bedroom w/Crib, TV; Queen Bedroom w/Flat Screen TV, Deck access, shares Full Bath (Tub/Shower) w/Bedroom w/2 Bunk Sets w/TV, Deck access. Upper Level: Great Room w/Large Flat Screen Direct TV; Kitchen w/Breakfast Bar seats 6, Dining Area w/Table seats 10, Keurig; King Master w/Flat Screen TV, Jacuzzi & Separate Shower, Ocean View; Washer / Dryer in Hall Closet; Half Hall Bath. We had a wonderful family vacation, very grateful our three huskies could join us. The view from the upper deck was amazing to watch the sun and the moon rise over the water. Every day the horses would visit. Thank you for your awesome review! 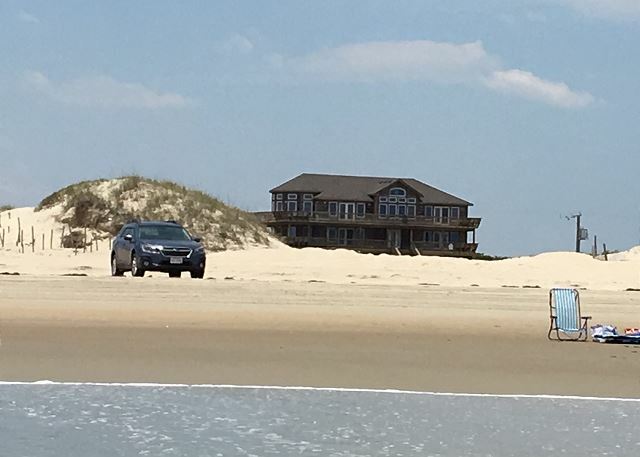 We are thrilled to hear that you enjoyed your time spent here on the Outer Banks! We absolutely loved this house and plan to rent two weeks next year! There were only a few minor things I’ll mention, not because it caused a huge problem for us, but I’m sure you would want to know so that you can address the issues. The washer and dryer in the rec room did not work. Washer did not spin to drain water and dryer door wouldn’t shut. The pool furniture was stacked in the garage and not around the pool (also a bit dirty). Also, all of the deck furniture was in the living room. We did come in after the hurricane passed but it would have been nice if the outdoor furniture was put back outside. Please know that none of these things were a problem or took away from the overall beauty of this house. The location is exceptional and we will come back every year as long as you’ll have us! Loved it! Thank you so much for taking the time to leave a review. It's feedback like yours that helps us provide the best possible guest experience. We hope to see you again in 2019! House was great as was the location. Clean and well maintained. We have vacationed at this house for several years and the entire family looks forward to this location and this home every year. Our stay in the house was 5 stars! The house was very clean and everything was as advertised. When we addressed a few issues with property management company (just general maintenance problems) the staff that arrived at the house could not have been any friendlier and helpful. I would definitely stay here again and recommend this house to my friends. Thank you so much for taking the time to leave a review. We are glad you had a wonderful stay and that any concerns were able to be addressed for you.